Welcome to the Clarkson Estate. 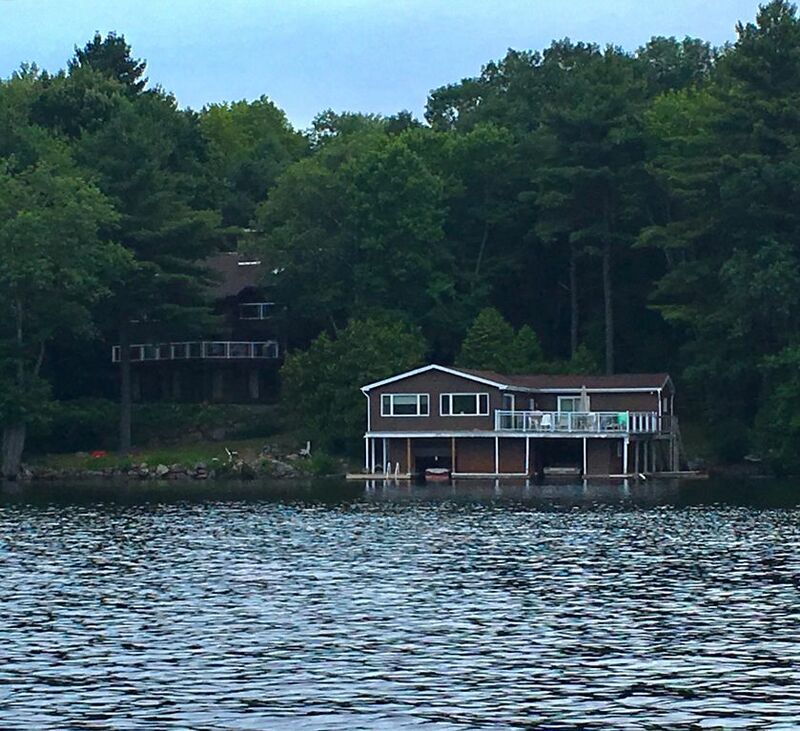 This 3000 sqft cottage and 900 sqft boathouse offers gorgeous views and a calm bay perfect for your next getaway. The Clarkson Estate is located on a private road off of Mortimer’s Point Road only 9 km from both Port Carling and Bala, two hubs of cottage country. The Estate resides on a small inlet bay yielding warmer water temperatures with southern exposure providing you and your guests with sun all day long. The cottage has 4 bedrooms, all of which have access to a balcony or deck, and 3.5 bathrooms while the boathouse provides an additional 2 bedrooms and 2 full bathrooms. We also offer access to our Bunkie that has 3 more beds and a private screened in porch for an additional charge. Included in your rental are a floating dock and 6 boats: 2 kayaks, a canoe, a rowboat, and 2 paddleboats. If you choose to bring your own boat, you can dock it on the boathouse dock. The estate also has a lakeside fire pit which is perfect for a relaxing evening. While cable TV is included, Wi-Fi is also available at an additional charge ($75/week). The Clarkson Estate is located on Lake Muskoka, which allows you to boat to Lake Rosseau and Lake Joseph with ease. Swimming from the boathouse is perfect for all ages with water depths ranging from 3 to 7 feet. A backup generator automatically powers both the cottage and boathouse during power failures. Our family has been in the Muskoka region since the 1800's. We hope your stay can bring you as much joy as our family has experienced over the generations. Security deposits are paid back within 14 days of check out. 3-4 day rentals are permitted, but security deposits for such rentals are $1,500. Pets are permitted, but there is a $250 fee per pet. No partying groups will be permitted. VRBO cancellation policy is not accepted by or binding on the owner. See occupancy agreement for details. The cottage has lakefront footage and the boathouse sits directly on the waters of Lake Muskoka. There are various thermostats in many different rooms. Please be sure to turn off the heat on each thermostat when leaving. One in the cottage and one in the boathouse. Please leave both washers open to allow insides to dry. One in the cottage and one in the boathouse. Approximately 8-9 cars can fit on the property. Please refrain from parking on the septic field. Wi-Fi available at an additional charge ($75/week). Couches and additional seating can be found in both the cottage and boathouse. All necessary dishes and utensils included. Full kitchens in both the cottage and boathouse. 8 can sit at the dining table. The patio set on the balcony can provide additional seating if needed. A 46" TV in the master bedroom in the cottage, a 48" TV in the lower level entertainment center in the cottage, and a 40" TV in the boathouse living room. One in the entertainment center of the cottage and one in the boathouse. Two kayaks and a canoe provided. Two paddleboats and a rowboat provided. Four decks/balconies are included with the cottage. One patio is included with the boathouse. However, there are also lower docks on the boathouse. Some life jackets are on the premises, but I'd suggest you bring your own for proper sizing. We had a wonderful week with our children and grandchildren! The cottage and boathouse provided lots of space for everyone to spread out. Situation in a cove, the lake was calmer and great for water fun such as water skiing, tubing, paddle boat, kayaking and swimming. We rented a pontoon boat and took many boat rides around the lakes. On a rainy day we shopped in the quaint shops around the area and our grandkids loved the trip to Santa's Village. The cottage facilities met our needs as a family and we had a great family vacation! Cottage and boathouse were well equipped. Loved that there was enough room for our extended family to spread out with each unit having their own bathroom. Main floor bedroom and bathroom had features like grab bars that made it easier for someone with mobility issues. Upper bedrooms were light very early in the mornings, and could have benefited from blinds. Having access to kayaks, a canoe and paddleboat was a bonus, and a fun way to explore the lake. Boathouse and deck could get very hot. Owners were quick to respond to any questions or issues. A fantastic place for our vacation. We stayed on the property in August 2015. There was ample space for 4 families and we had a wonderful time. The house is very clean and well-maintained. The amenities were also quite convenient. We plan to return. Awesome place for a large group! I went with a group of 5 families (16 people all together) and we had a great time! The cottage and boathouse were both very clean and spacious. All the basics were provided when we arrived. We loved the fact that the tap water is treated so we didn't have to constantly be hauling bottled water in. We also liked that linens and towels are provided. Each of the cottage and boathouse have a laundry room so we were able to do laundry as we went and didn't need to bring a week's worth of clothing. The dump is located a mere 1.2 km away so it is very easy to keep the garbage and recycling that 16 people generate on vacation under control :). The only thing that was missing was WiFi but the owners indicated that they are on a list to get WiFi and will hopefully have it soon. My fiancé and I went there for our bachelor and bachelorette parties and everyone had such a great time!! I cannot stop thinking about that cottage and how much I want to go back! Everything was very neat and there's enough supplies there if ever you forget something. Everything was absolutely perfect. From the fire pit, to the boat house, to the ample space... I couldn't of asked for a better weekend! We are definitely going back next year!! Our party of 18 fit just fine, with extra space, furniture, and beds. The entire property is in excellent condition, both inside and out. The view of the lake is one of a kind, with ample non motorized vehicles to explore it with. The boat house provided a great space for daytime relaxation, complete with barbecue, and a large deck. The cottage provided a comfortable hang out for those chilly nights on the lake. The fire pit was exceptional with lots of space for everyone. The property was very easy to find, and the downtown is not far from the cottage. Tom, and his brother, the owners, are everything you would want to deal with, when choosing a destination. They were very friendly, honest, fair and on the level when hashing out the details of the trip. My only problem was that we couldn't stay longer!I would recommend this cottage for a large party destination, such as a bachelor party, or a getaway with some friends, or the family. 10/10 in my books! $300 cleaning/mgrs. fee charge added to rental price. ****Rental is not secure until occupancy agreement is signed and returned and initial deposit is paid. ***** ****Security deposit is $1,000 for pre-peak season rentals and/or large group parties. ****If paying through VRBO (Book It Now Button), you will have a $250 credit card fee which would be deducted from your damage deposit/security deposit when the deposit is returned to you. VRBO charges us for using their credit card services. Hence this fee is passed along to you. ****** $300/person fee over 20 occupants for the week.